So you’ve decided to come to Minnesota to watch some soccer. Smart move. There’s a brand new stadium that might just be the best in the country, a home team with an I-can’t-believe-it’s-still-so-shaky defense, and raccoons that climb high rises. What more could you ask for in a soccer away day destination? Over on this site, we believe that fans from around the country should feel welcome to spend lots of their money in the Minnesota economy. Thus, I’ve put together an extensive guide on how to get around, where to eat and drink, and what to do in your spare time. Now, I know what some readers are thinking. “Hey, wait a minute, you don’t even live here.” Friends, that’s what makes me the perfect writer for this guide. Who knows the experience of visiting better than a visitor? Checkmate. By Air: Despite being far away from other major cities, the Twin Cities are easy to reach from just about anywhere in the United States and Canada thanks to the miracle of modern air travel. If you are a fan living in all but two MLS cities, you’ll probably be arriving by plane. Minneapolis-St. Paul International Airport (MSP) is a major Delta hub, and partly as a consequence, the airport has non-stop service to every single MLS market. The airport is also clean (Gayle King loves the bathrooms), efficient, and has good retail options. For the past three years, it has been rated the best in the country for its size. Leave a nice review! By Train: MLS fans in Chicago are best positioned to take advantage of Amtrak’s Empire Builder service. The train takes just under eight hours from Chicago Union Station to St. Paul’s Union Depot. That’s slightly longer than driving, but it can be less costly (the breakeven point for the cheapest Amtrak ticket is between four and five people per car), and you can stretch your legs and watch cat videos the whole time. Amtrak drops passengers off at St. Paul’s Union Depot, which is in the interesting Lowertown neighborhood of downtown. There are a number of bars and restaurants within a couple blocks. The Union Depot itself is quite a nice place, having been completely and lovingly restored with a lot of money from the American Recovery and Reinvestment Act (more commonly known as “the stimulus”). By Car: Residents of Kansas City, Chicago, and maybe even further afield, might opt to make a road trip out of it. You don’t need an online guide of written directions to tell you how to navigate by car to the Twin Cities, do you? Unless you drove to the Twin Cities, or are staying longer than a weekend and want to explore the state, I do not recommend renting or using a car for your trip. It costs a lot of money, isn’t necessary for a long weekend, and the glaciers are melting. A Simple Map Of The Twin Cities: Imagine an equilateral triangle, with the point facing down. Consider the bottom point to be the airport and the Mall of America. The top left point represents downtown Minneapolis. The top right point represents downtown St. Paul. The midpoint in the straight line in between the two top points (both downtowns) is Allianz Field. Public Transit: The Twin Cities have a light rail system of two lines, the Blue and the Green. While small, the system is fortunately quite useful, especially for weekenders. 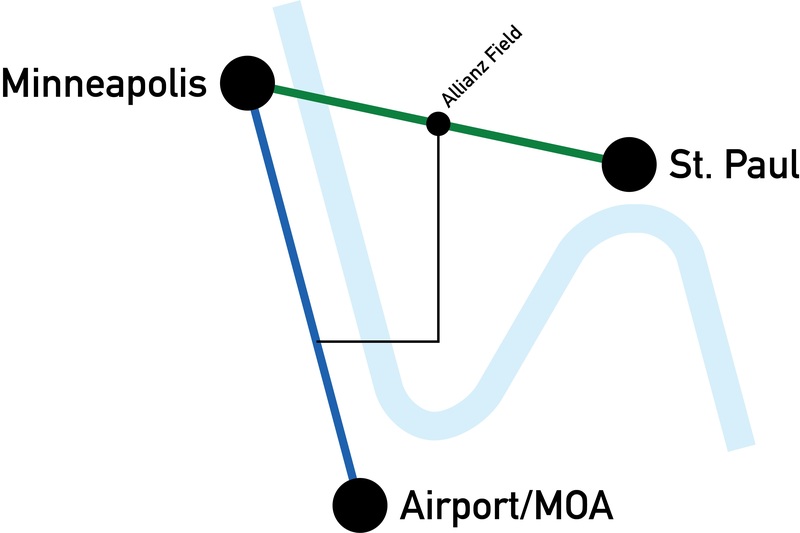 The Blue Line connects downtown Minneapolis to the Airport and (beyond that) the Mall of America. It happens to be one of the best airport-to-city travel options in the entire country, and it’s highly recommended that visitors make use of it. The Green Line connects downtown Minneapolis to downtown St. Paul. Allianz Field lies just steps away from the Snelling Ave station. It is not alone in this proximity, in fact, every major sporting venue in the metro area lies along this line, which essentially begins at a professional baseball stadium and ends at a minor league one. This line also passes directly through the University of Minnesota. Fans who are staying near Allianz Field, or planning on traveling straight from the airport to the stadium (or visa versa) can take advantage of a nifty transit shortcut (which I’ve marked with the thin black line in the map). The A Line is the first of hopefully many rapid bus routes in the Twin Cities. It runs every ten minutes, has limited stops, and you pay before you board. It’s a fast and frequent bus. Conveniently for soccer fans, it rolls directly past Allianz Field. To make the connection from the airport to the stadium, take the Blue Line light rail, and get off at 46th Street Station. Directly adjacent to the station is a bus turnaround, where one of the stops will have a fancy pylon, a nicer looking shelter, and a dark blue bus idling (the driver will probably be taking a short break until the scheduled departure time and may have temporarily locked the bus, don’t panic, just wait at the shelter, the bus will leave within ten minutes). That’s your ride. You can’t really miss the stadium, but just to be clear, get off at the Snelling and University stop. Wait around for a decade and there will likely be a rail route between the airport and downtown St. Paul. Until then, there’s the #54 local bus service. The good news is that it’s frequent (every fifteen minutes) and fast. The bad news is that you have to pay onboard. Transit fares are $2.00 off peak, and $2.50 on peak hours. You can make free transfers for two and a half hours after paying a fare. Metro Transit offers 24 hour passes and prorated “All-Day” passes. These passes generally make sense if you plan on paying three or more fares in a day. Within the central areas of the cities, buses are relatively frequent, and have good on-time performance in normal weather. Bikes and Scooters: The Twin Cities have a bike share system called NiceRide Minnesota. This year, thanks to some pretty dumb reasons, they are not operating in St. Paul. However, that just means their coverage in Minneapolis is even better. Their fleet is mostly dockless, and they are rolling out electric pedal assist bikes, which are awesome. If you are touring around Minneapolis, there won’t be a better way to get around. Also an option are the electric scooters that many visiting fans may already know from their own cities. Lime and Bird are the two most prolific options. You may already know that the Twin Cities, and especially Minneapolis, are considered among the most bicycle friendly places in the country. Both cities, but again especially Minneapolis, are building out a network of protected bike (and scooter) lanes. But the real secret of the area’s friendliness to two-wheeled transportation is the incredible network of urban trails that are not just nice for recreation, but are also extremely useful for getting around. Visitors who want to spend an afternoon exploring Minneapolis’ Chain of Lakes can get there directly from downtown with almost no encounters with cars by taking the Cedar Lake and Kenilworth Trails. Visitors looking to explore South Minneapolis, Midtown, and Uptown, will want to take the Hiawatha Light Rail trail to the famous Midtown Greenway, a true bicycle highway in the heart of the city. Your Feet or Wheels: When the snow is gone, Minneapolis and St. Paul can be good cities for walking or rolling. The classic place to walk around is the downtown Minneapolis riverfront, with its historic mill buildings, the Stone Arch Bridge, and the mighty Mississippi roaring below. St. Paul has some fantastic strolling options as well. Fans staying in the vicinity of Allianz Field should head south to Summit Avenue. Fans staying downtown should head east and climb the hill. This road runs from the city’s western Mississippi border to the imposing cathedral that overlooks downtown, and is lined by beautiful trees and mansions built by some of the state’s most famous figures. The official Governor’s residence is on Summit Avenue, as is the massive home of the railroad baron James J. Hill, which is open for tours. Everyone needs to eat! Fortunately the geniuses at Minnesota United have not lost sight of this fact, and Allianz Field is outfitted with an impressive array of food options. Visiting fans certainly could do worse than stadium food. This is by no means an exhaustive list. If you want to do a deeper dive, I recommend starting with Eater’s local guide, or browsing the Eat and Drink archive of the Star Tribune. A perennial name in local “Best Of” lists, Fasika offers fantastic Ethiopian food. Perfect for vegetarians and groups who want to share. Another frequent “Best Of” winner, On’s has a massive menu and Thai food that doesn’t dumb anything down. Popular local breakfast/lunch/dinner place with a diner menu and better-than-diner food. Legendary cramped local bar, with a creative assortment of Jucy Lucys (cheeseburgers with the cheese inside the patty, basically the signature food contribution of the Twin Cities). Has since expanded to three other neighborhoods, but this is the original. Partially owned by a sitting US Congressman, Penny’s serves quality coffee and menu that specializes in crepes. One of two, the stunning downtown Minneapolis location is in the base of a recently renovated modernist office tower designed by Minoru Yamasaki. Recently taken over by one of the best chefs in the region, with excellent results. Menu heavy on sharing. Do you like meat and dark liquor? Go here. The most nationally acclaimed Twin Cities restaurant, maybe ever. The flagship for the cities’ high cuisine scene. For travelers with a deep budget and a food obsession to rival their soccer fix. Wood-fired pizza with fresh and creative ingredients, often from the farmers market across the street. Indulgent breakfast and brunch place. Both a fine dining restaurant and a neighborhood haunt. Comfort food done really well. Two restaurants, a high end fishmonger, butcher, and bakery all in the same small food hall. There’s a cheaper beer and burgers option (Birch’s Lowertown) and a fancier seafood option (Octo Fishbar) run by one of the local area’s longtime culinary standard bearers. Co-locating all of these businesses together creates some interesting opportunities. You can buy from a vendor here, take it to the kitchen, and they’ll prepare it for you. The Twin Cities’ first food hall and a classic. Directly next to the Midtown Greenway. Located in a massive converted former Sears warehouse (you can’t miss it), with food options that span the globe. If you can’t decide, put your trust in Manny’s Tortas. The Twin Cities’ newest food hall, recently named the best in the country by USA Today readers. From superb barbecue (Revival) to fine dining (In Bloom). Plus, there’s a specialty honey store, a mushroom growing chamber, and an offline outpost of our friends at Talisman Caps. Original home of the Jucy Lucy. When Obama was in town, he went here, so make of that what you will. Cash only. The best place to go for families traveling with elementary school-age kids. Brasa has a fast casual approach and a menu that revolves around rotisserie chicken. Delicious arepas, great outdoor space, neighborhood fixture. Incredible pizza and Korean food, from a perennial James Beard Award nominee. Small but mighty Italian restaurant. Renowned for their cacio e pepe. Popol Vuh is a fine dining Mexican restaurant that has gotten national praise and attention, and should be on the list of the deep budget food travelers. Centro is its casual taco shop brother next door that has received its own share of acclaim. Both are directly next to some of the cities’ best breweries (see next section), so if you’re exploring Northeast Minneapolis, this is a natural stop. The Twin Cities are freezing cold and blanketed in snow for a third of the year, which means it’s essential to have a good drinking scene. The list below focuses on breweries, bars, and cocktail bars. As was true above, this list is by no means exhaustive. How could the first option not be the beautiful new bar in the stadium itself? Open not just on gameday, with an aim towards being a soccer bar even when the game isn’t being played in front of you. Lots of taps. Owned by FiftyFive.One’s very own Wes Burdine. Formerly one of the oldest queer bars in the Twin Cities, now one of the only queer and soccer bars anywhere. Will often open early on weekend days if there’s a match worthy of it. Maybe the most famous national name from Minnesota’s beer scene, Surly certainly has the most stunning premises. Their destination brewery has great outdoor and indoor spaces, good food, plus a pizzeria upstairs. Located in a converted grain silo, next to railroad tracks, in an unassuming industrial park, this is a hard-to-find spot that’s worth the unusual trek. Directly next to another brewery, Urban Growler, which has a knack for fruit beers. The best brewery in the downtown area of Minneapolis in my book. Modist is interesting not just because they make good beer, but because they use a mash filter, which saves water and allows them to make unusual tastes. This inclusion stretches the definition of downtown slightly, but it’s justified for a venerable brewery like Town Hall. They’ve been around for over two decades, their in-house beers are faultless, and they tap a well-curated list of guest beers as well. Underneath a great restaurant (The Bachelor Farmer) and Menswear store (Askov Finlayson). There’s no sign, so you know it’s hip. Purple door. Great cocktails. Famed for their martini. It’s a hotel bar, but the location at the top of the Foshay Building, Minneapolis’ first skyscraper, can’t be beat. Probably the best brewery opened in the Twin Cities in the last couple years, and a great testament to the second generation of local brewers, who were trained in the first wave of craft breweries. Barrel Theory’s work is generally both exceptional and adventurous. Founded by former electrical engineers, with theme to correspond. Tin Whiskers was always good, but they’ve gotten better and more ambitious over the years. They’ve recently launched a series of beers in collaboration with the over-century old St. Paul candy company Pearson’s. Dutch bar with good snacks and a full calendar of all different types of live music. Tucked away on the far edge of Lowertown, the Black Dog Cafe has been around for over twenty years. It’s one of those blessed places that starts off in the morning as a coffee house and transforms in the afternoon to a bar, with live music in the evenings. Good food at all hours. One of the most beloved breweries in the cities, thanks to their iconic can designs and their unique seasonals. A co-op brewery with great style and even better sour beers. Local masters of the stout and porter. Neighboring Latin-American brewery and British distillery, because of course. They’ve got a futsal court outside. Easily recognized for their beautiful can art, this brewery has hit its stride since settling into a permanent space on West 7th. The biggest and most respected craft brewery in the Twin Cities, their EPA was the first local craft beer that many Minnesotans had. A bit slower to respond to the explosion of taprooms, but they now boast a nice beer hall a short walk from West 7th. St. Paul is a city of cozy neighborhood bars. The Happy Gnome might have the most extensive drink menu of all of them, plus a patio for warm weather. Right at the end of the A Line and along the Blue Line, Venn Brewing is a great neighborhood brewery and perfectly positioned for visitors who have an extra hour before heading to the airport. Look, let’s get this out of the way up front. Yes, there is a mall in the Twin Cities. Yes, it is quite large. Yes, there is an amusement park and an aquarium inside. Yes, it is sorta fun. But look folks, did you travel all this way to a new city just to walk around indoors and marvel at chain retailers? Please say you didn’t. Minneapolis-St. Paul has a lot more interesting things to do than that. If you’ve got a long weekend in the Twin Cities, here’s a bunch of things to do that are far more interesting. On the edge of the river bluff in downtown St. Paul. Great museum for kids and also plenty to interest adults. Brand new museum of natural history. Highlights include a giant stuffed woolly mammoth and a planetarium. Built into the ruins of a downtown flour mill that was destroyed in a collossal explosion, this museum tells the history of Minneapolis through its milling industry. Great museum for middle school kids. Fascinating for adults. Tony Award-winning regional theater in downtown Minneapolis. Flagship of the Twin Cities’ formidable theater scene. Building designed by Jean Nouvel, with a cantilevered bridge out towards the Mississippi that is open to the public. One of the quirks of having two semi-rival cities in one metro area is that you have two of a lot of good things. The Twin Cities have two storied orchestras. The Minneapolis version is larger and more well-known, with their own concert hall. The St. Paul version is smaller and performs all around the metro area. The Twin Cities’ premier modern art museum. 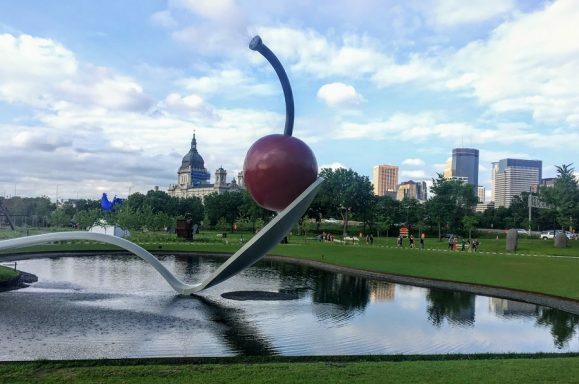 Perhaps best known for its free sculpture garden outside (open every day), which features works like the Spoonbridge and Cherry and one of the world’s two giant blue roosters. The Twin Cities are one of just ten metro areas in the country with teams in the five largest men’s professional sports leagues. Of that ten, only Denver is smaller. But the Twin Cities may be even more saturated, when you factor in one of the most popular minor league baseball teams in America (Saints), the most successful WNBA team in history (Lynx), the reigning NWHL champions (Whitecaps), and all of this without even mentioning a Big Ten University with three revenue sports.At various points in the MLS season, all of these teams will be playing. All of them are playing in new or barely-aged arenas. The baseball stadiums, in particular, are among the best in the sport. If you’re looking to catch another game of some kind, the best value for your money are the Saints, who fill in the gaps of a baseball game with an endless supply of minor league gimmicks. Minneapolis’ nickname is “The City of Lakes” and for good reason. The city’s lakes are the jewels of its best-in-the-nation-for-six-years-running parks system. The lakes are all connected by walking and cycling trails, and visitors can spend an entire day exploring them. The mighty Mississippi River starts in Minnesota, and flows through both Twin City downtowns. The Minneapolis riverfront is more famous, and crossing the Stone Arch Bridge is an essential thing to cross off your list. But the entire riverfront is scenic, in fact, it’s all part of the national parks system. In North Minneapolis, the Parks Service operates a simple and easy kayak rental program modeled after bike share. In South Minneapolis and the western edge of St. Paul, the river plunges into a gorge, with public parks and trails along the entire rim. You’ve reached the end of this guide, but you’ve barely scratched the surface of things to eat, drink, and do in the Twin Cities. I think it’s a nice place, which is why I spend so much time cheering for its loser sports teams. If you found this guide useful, please let me know. If I made a mistake or left something crucial out, please also let me know, but more discretely this time. Feel free to chime in in the comments below as well.